Like every summer, we paid our routine visit to Tamil Nadu a couple of weeks ago. I started preparing KT for the trip weeks in advance telling her that we’ll see Thathus (Granpa), Gammu (Granma) and Jonthin (my brother, Jonathan). Being the animal lover she is, I got her excitement pumped up telling her that we’ll meet puppy doggies, goats, cows, hens and peacocks. She was super thrilled that each time she spoke to my parents over phone, she enquired about the well being of all those animals and asked my dad if she would get to carry them when she got there! We left the evening her school closed for this academic year. Our first stop was Tanjore. Mum and dad have built their retirement home there and will be moving their shortly. Having grown up in a beautiful campus like BHEL Trichy, which is well planned with schools, club, shopping complex et all, complete with lush greenery, I still haven’t made peace with the fact it’s time for mum and dad to move out for good to Tanjore. However, KT loves the place. It’s outside the city. The neighborhood is still developing. Quiet. A stretch of wide open space on two sides. A perfect home for retirement life according to my parents! KT was in full form from the time we stepped foot there. She went touring the neighborhood with mum and dad in turns. 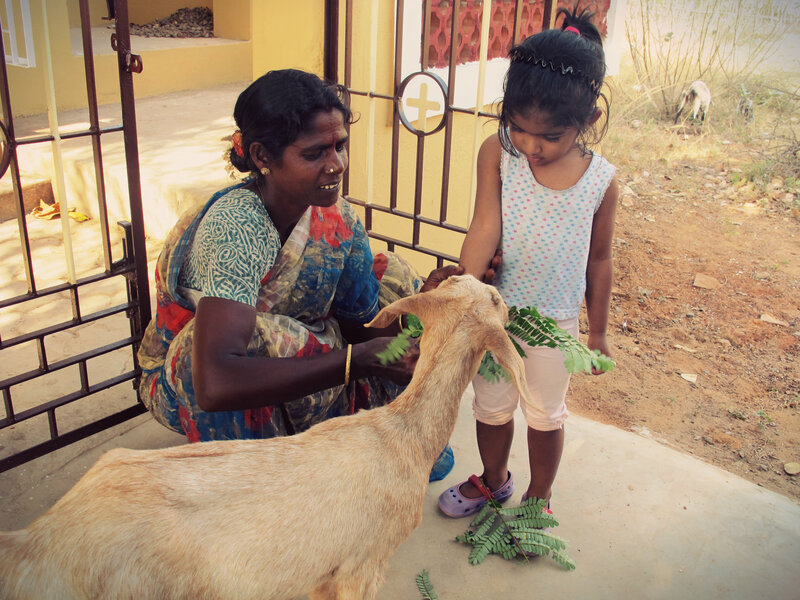 Every evening a shepherd lady brings her flock of goats to graze in front of our house. That’s the moment KT was waiting for. She enjoyed feeding them and caressing them! As the sun slowly set, she was very sad that it was time for the goats to head home. Summers in Tamil Nadu is no stranger to me. I grew up there, spent three quarters of my life there. But the scorching heat during this visit was simply horrific! To make matters worse, we had a 10 hr powercut every single day! So we made a quick escape to the hills of Kodaikanal! Although this was KT’s second visit, I was excited to have hubby join me for the first time. 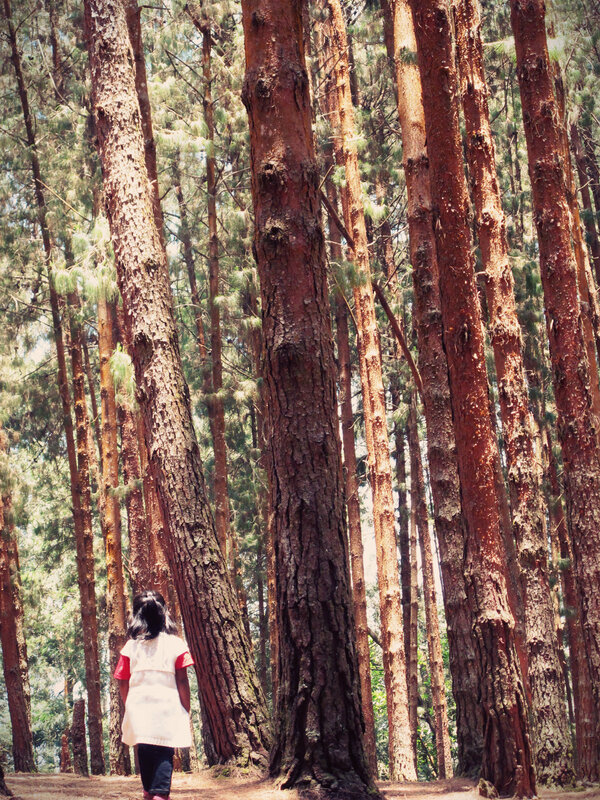 The weather in Kodai was an absolute treat to our sullen scorched souls. I wanted KT to have a go with horse riding and boating. Hubby accompanied her horse riding. Despite being a little scared, my girl put on a courageous face and went galloping away. The horse’s name was Johnny and she still enquires about it! Boating was another activity we’d never forget. KT theoretically knows what a boat is from stories and pictures. This was her first boat ride. My mom and I were a little apprehensive as to how safe it was for an almost 3 yr old. Nevertheless, we went ahead after giving KT some basic safety advise. It is a ride I’ll always remember – The lake so still surrounded by beautiful scenery and my little girl next to me singing ‘Row, row, row your boat’ as loudly as she can. Unforgettable! After four blissful, cool days at Kodai, we returned to Trichy. The heat was overwhelming that the first thing we did when we got there was give KT a haircut. I call it the Dora cut! This trip is quite sentimental to me as it was the last time we’ll be staying in BHEL – the little world my childhood revolved around. Though I could not do a couple of things I wanted to like visit my school and take KT swimming at the club (the pool was under renovation), I took her to the Deer Park! Oh the joy on her face when she met those deers – priceless! 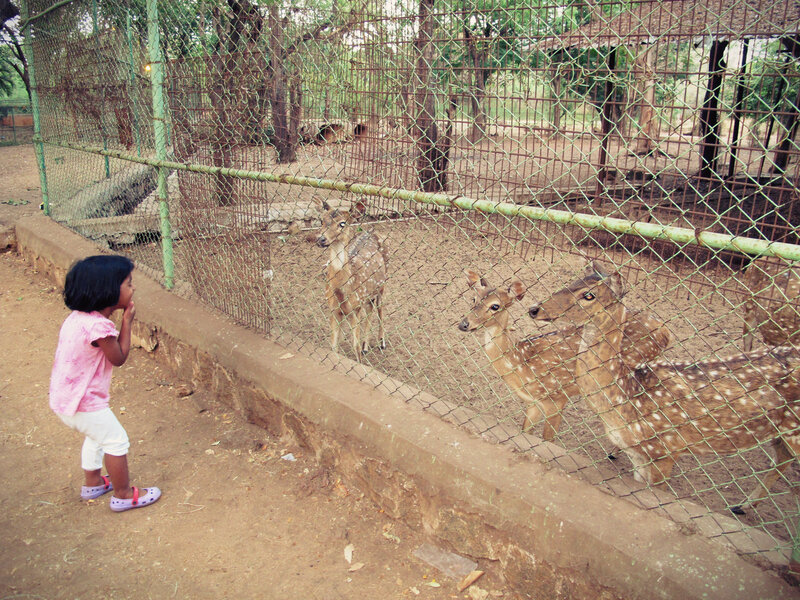 She went, “Awwww.. Chellam.. Cutie..” with each deer she met. After a little play time on the slides and swing, we headed home! 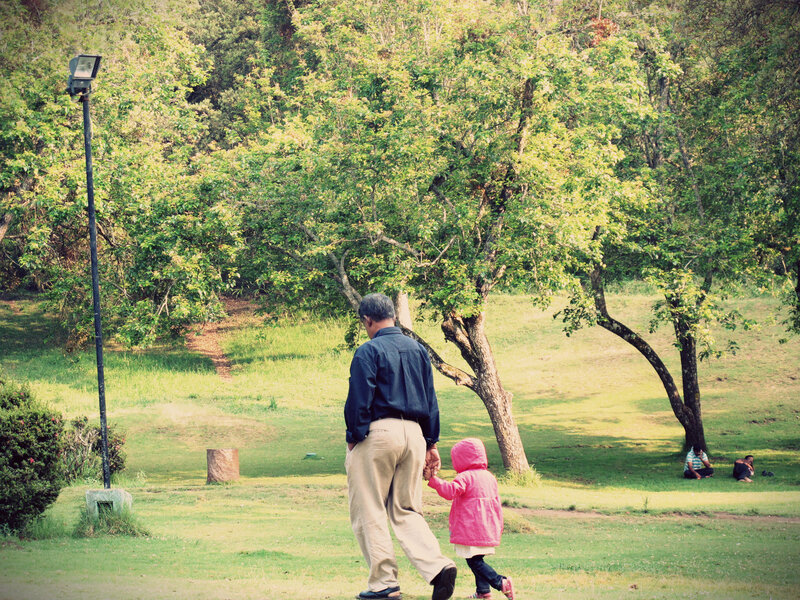 Apart from the places we went and things we did, what stands out is the precious time KT enjoyed with my parents and my brother. I don’t remember how my parents were to me when I was a 3 yr old. But the relationship they share with KT is something I enjoy sitting back and watching. They connect on a completely different level. I feel so blessed! As flattering it was to hear that I looked like a Queen from my 3 yr old (well, almost 3 yr old), it got me thinking how my daughter sees me. Knowingly or unknowingly, I am the woman who means everything to her (at least for now!). Say, a Queen to my little princess in many ways. I just hope and pray I do justice to the enormous responsibility God’s bestowed to me as a mother!